If you can’t stomach another soy burger, here are some easy recipes from vegetable-minded chefs. It’s a warm summer evening, and you’re on a back porch with a group of friends, drinking a beer and getting ready for dinner. Someone passes you a paper plate, a seeded bun, and—wait, you don’t eat meat? Oh. Well, here’s a tomato and some lettuce. If you steer clear of beef, you’ve probably experienced a similar scenario. If you’re lucky, you maybe even found a frozen soy patty masquerading as a burger that, when grilled, sort of tasted like nothing, and drenched it in mustard. I know: Vegetarians need to stop whining about missing out at barbecues because we choose to ax delicious, juicy hamburgers from our diets. But even if you’re just trying to cut back on meat, or trying to impress a vegetarian, the alternatives usually offered are lackluster at best, and unhealthy and environmentally questionable at worst. As my colleague Kiera Butler reveals, it can take just as much energy to produce a veggie burger as a beef burger, and many soy-based fake meats are processed with hexane, a neurotoxin. Luckily, there are savory alternatives to this dilemma, made from ingredients you probably have at home. I reached out to a few vegetable-oriented chefs and cookbook authors for their favorite burger recipes, which are shared below. Some of them are vegan and gluten-free, too. And you can always freeze them after you’ve made a bunch, so next gathering, you’ll come prepared with a burger made with unprocessed ingredients and devoid of mystery chemicals. Steam or boil the potato until tender. Mash with a fork. Trim off the stem of the portabella mushroom and scoop out the gills. Chop into 1/2-inch pieces. Thinly slice the crimini and shitake mushrooms. Preheat oven to 375° F.
Heat 1 tablespoon of the oil over medium heat. Cook the portabello mushrooms and dried thyme for 6 to 8 minutes, until the mushrooms begin to soften and sweat. Add the crimini and shitake. Cook for 10 minutes, until the mushrooms have sweat off their moisture and it has dried up in the pan. Deglaze with the vinegar, scraping off browned bits with a wooden spoon. Transfer mushrooms to a food processor and coarsely purée. (Alternatively, chop the mushrooms finely by hand.) Combine the mushroom mixture with the potato, barley, salt, pepper, and mushroom mixture in a mixing bowl. Shape into patties. In a large oven-safe skillet or nonstick sauté pan heat the remaining 2 tablespoons oil over medium-high heat. When hot, add the patties and cook until browned on each side, 6 to 10 minutes total. Transfer the pan to the oven and bake for 12 to 15 minutes, until the burgers are firm and cooked through. Don’t forget to “go crazy with the condiments,” adds Volger: yogurt sauce, caramelized onions, homemade pesto, or more sauteed mushrooms, as pictured above. Recipe from Veggie Burgers Every Which Way: Fresh, Flavorful and Healthy Vegan and Vegetarian Burgers—Plus Toppings, Sides, Buns and More, copyright © Lukas Volger, 2010. Reprinted by permission of the publisher, The Experiment, LLC. Recipe editor Emma Christensen loved the legendary beet burgers at the Northstar Cafe in Columbus, so she and fellow Kitchn bloggers set out to recreate their own version. 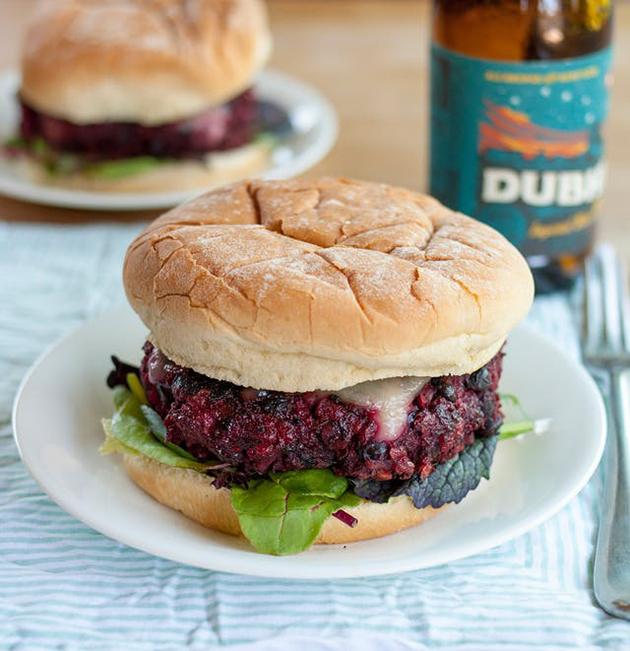 The resulting burger, writes Christensen, “had a deep, savory umami flavor” and unlike other veggie burgers, “captured that unique hamburger texture.” Dice the beets really small, she notes, and don’t use a food processor if you’re trying to avoid mushiness. I liked how this burger uses lots of cheap and readily available ingredients; find the full recipe here. “Whole-food dishes like falafel—chickpeas ground up with spices and then deep fried—might be a better beacon towards a less meat-intensive future,” writes MoJo‘s food and agriculture blogger, Tom Philpott. Falafel might be the ticket to a better burger, too. Having never made falafel before, I was surprised that you don’t pre-cook the chickpeas before they’re ground. You simply give them a 24-hour soak, drain them (reserving some of the soaking water), and drop them in a food processor with a few other ingredients: onion, garlic, parsley, paprika, ground cumin, ground coriander, a little lemon juice, and salt and pepper. Then you pulse the mixture, using as little of the reserved water as possible, until it forms a kind of rough paste. I found that the whole thing came together quickly, with only a splash of water. With very little fuss, I suddenly had a whole bowlful of batter that looked fit for a real falafel joint—minimalist, indeed. Following Bittman’s orders, I tasted the batter for seasoning, decided to ramp up the coriander, cumin, paprika, and salt. To make this falafel work as a burger, I’d recommend pan-frying or baking larger patties. Lay one large or a few small falafel patties onto a toasted bun. Top with fresh cucumber and even a yogurt/tahini sauce, and end with some good old-fashioned ketchup. Blogger and chef Joni Marie Newman likes her veggie burgers first thing. In her 2011 cookbook the Best Veggie Burgers on the Planet, she includes recipes for 10 breakfast burgers, with ingredients ranging from tofu to potatoes to oats. A personal favorite of Newman’s is her sweet caramelized onion burger, because “sometimes sweet and savory with a bit of salty is all I crave.” Like the recipes above, this burger is devoid of soy and uses simple foods. Preheat the 2 tablespoons (30 ml) oil in a skillet over medium-high heat. Add the onion, mushrooms, and garlic. Add a pinch of sea salt to really get those onions sweating. Sauté, turning often, until the mushrooms have reduced in size by about half, or about 5 minutes. Add the maple syrup and vinegar, lower the heat to medium, and cook for about 10 minutes longer, stirring occasionally, or until most of the liquid has been absorbed. Add a liberal amount of freshly cracked pepper to taste. Remove from the heat and let cool. Transfer to a mixing bowl. Add the flour, cornstarch, pine nuts, parsley, and liquid smoke, and knead until a nice dough forms. If you think the mixture feels too dry, don’t worry; keep kneading and it will come together, I promise. Cook as desired. Bake at 350°F (180°C, or gas mark 4) for 30 minutes on a baking sheet lined with parchment or a silicone baking mat, covered loosely in foil, flipping halfway through. Or pan-fry in a small amount of oil over medium-high heat for about 3 minutes per side, or until a nice crispy crust forms. Recipe courtesy Joni Marie Newman, author of The Best Veggie Burgers on the Planet: 101 Globally Inspired Vegan Creations Packed With Fresh Flavors and Exciting New Tastes. Have a favorite veggie burger recipe? Let us know in the comments section below.